The Under Armour Men's ColdGear Infrared Porter 3-in-1 jacket is a shell and liner that can be worn separately or zipped together for the ultimate winter coat. The outer shell features a 100% Polyester DWR finish to repel water without sacrificing breathability and a bonded two-layer twill fabric with a smooth taffeta lining and a windproof construction to shield you from the elements. 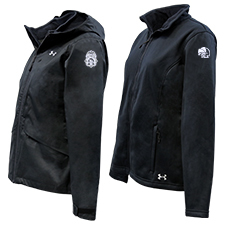 Features ColdGear infrared technology and a soft, thermo-conductive inner coating to retain body heat. Warm hand pockets have a zip closure and an internal headphone escape. The high-loft 100% Polyester fleece zip out liner traps heat for unrivaled warmth without excessive weight. Microbrushed face for ultra-soft performance. Signature moisture transport system wicks sweat away from the body. Branded with UA Logo on left chest. DEA Seal on inner jacket. DEA Badge on outer jacket. The Under Armour Ladies' Sienna 3-in-1 jacket is a shell and liner that can be worn separately or zipped together for the ultimate winter coat. 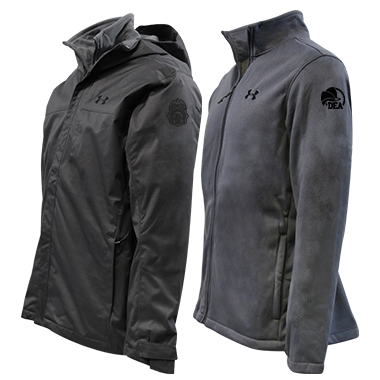 The outer shell has a highly water-resistant UA Storm technology that repels rain & snow for all-weather wear. ColdGear Infrared lining uses a unique ceramic coating that seeks, absorbs & retains body heat to keep you warmer, longer. Critically taped seams and a generous 3-piece hood with bungee adjustment. The zip-in100% Polyester fleece liner traps heat for unrivaled warmth without excessive weight. Princess seams for a more streamlined fit. Microbrushed face and high-loft Sherpa lining for ultra-soft performance. Signature moisture transport system wicks sweat away from the body. Full zip front with standup collar. Warm, secure zip hand pockets on both pieces. Branded with UA Logo on left chest. Seal on inner jacket. Badge on outer jacket.